I remember being impressed with the first Offshore yacht that I eyeballed more than a dozen years ago. 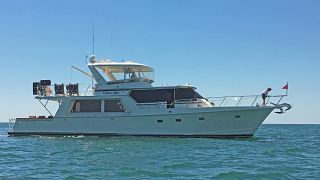 My attention had been directed to the 48-footer by a captain friend who had years of experience cruising in the Bahamas, managing the helm of a large custom motoryacht. 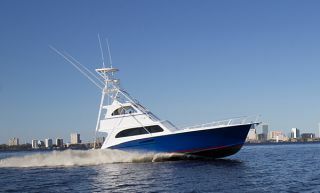 As is the case with most watermen, he had spent a good bit of his professional career dreaming of the perfect boat and the Offshore 48 was on his short list. The 48 appealed to others as well and 141 were delivered during the boat's production from 1984 to 2001. 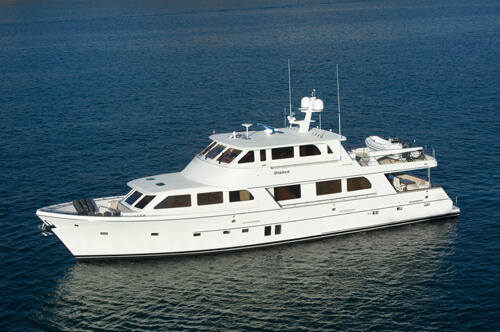 My interest in Offshore has never waned and I was anxious to inspect the builder's latest offering-the 64 Voyager. 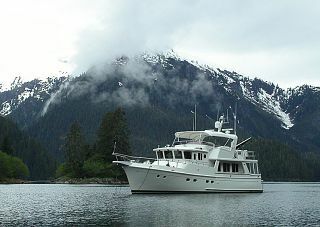 Offshore Yachts was the brainchild of Richard O. Hunt. When the U.S. government was exploring new methods of building boats following World War II, Hunt helped pioneer the use of laminated fiberglass for the Navy. By 1948, he had successfully applied his knowledge of fiberglass to the production of pleasure craft. I caught up with the new 64. Our test boat was the extended cockpit model in which tooling is used to extend the cockpit over the swim platform, which is integral with the hull. A bolt-on swim platform is added. This adds four feet to what is already a generous cockpit. Offshore's designs have always pleased those with a conservative cruising eye and the 64 meets this measure. She is a milestone for the builder in several ways. 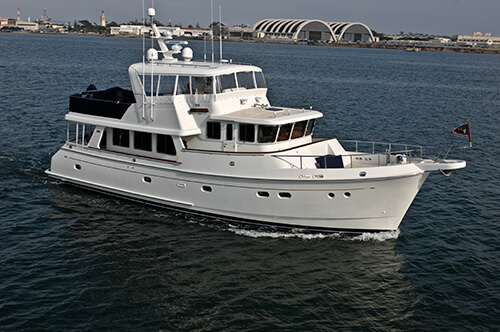 She is the first Offshore designed by San Diegobased naval architect Doug Sharp. I have known Sharp for more than twenty years and have always respected his ability and the breadth of his design portfolio. Sharp has had plenty of experience with cruising yachts and Taiwanese boatbuilders, so Offshore was a good fit. "I'd always admired Offshore's designs and I considered it a real opportunity to help them with something a bit different," said Sharp. "It was the Loco Buzzard, a 69-foot Sharp design that had caught our attention," said John Olson, president of Offshore West. 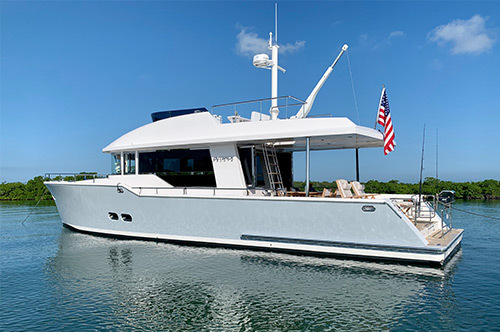 "We wanted the boat's basic arrangement with an outboard profile that complemented our line." According to Olson, the 64 was created based on customer input. "She's a natural choice for our owners that are moving up." "Virtually all of the folks that own our boats of less than 70 feet are owner-operators," said Olson. "We keep this in mind when we develop our layouts." 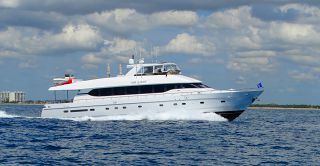 The 64's port and starboard pilothouse doors, full side decks and doors in the Portuguese bridge allow easy access fore and aft. Interior stairs leading to the flying bridge provide convenient access to the helm. 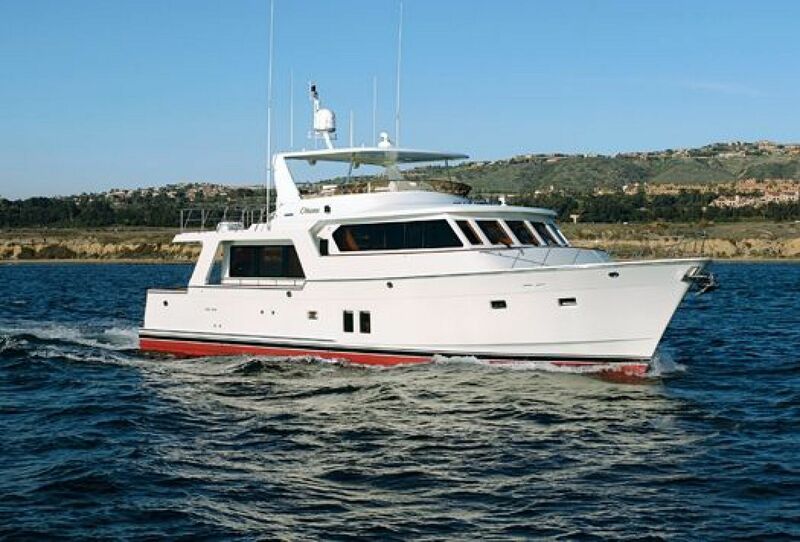 The bridge helm station is protected by a hardtop and has a lounge area with a wet bar. The boat deck has room for a 15- foot tender and there is a ladder that leads below to the cockpit. The 64's main cabin is open with a seating area aft. Steps lead up to the galley amidships and then up to the raised pilothouse. If I were running the boat short-handed, I would opt for the under-counter refrigeration and pass on the day-head. This would allow for an excellent view astern from the helm. The pilothouse lounge area can be laid out for guests to loiter (L-shaped) or as a spot for those off watch to snooze (straight). 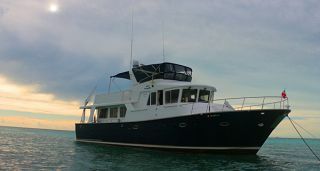 The belowdeck arrangement has a full-beam master with an option of either his and hers heads or a walk-in hanging locker. A guest stateroom forward has a queen island berth and shares a head with a third stateroom with single side-by-side berths. This stateroom is available with upper and lower berths, which allows for a third head. 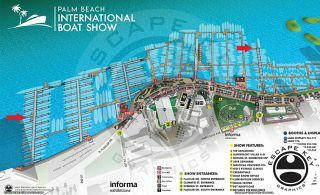 Offshore is also willing to work with customers on custom layouts. The 64's interior is offered in satin-finished mahogany or cherry, and a décor allowance is included in the price. Teak is optional as is a gloss finish. Solid woods are used for trim, and wood veneers are applied over a plywood substrate. Larger nonstructural interior bulkheads are cored with foam and insulation materials where appropriate. Offshore yachts are built at two yards in Taiwan. At one time yachts built in Taiwan were a value based solely on price. Today, second and third generations of Taiwanese craftsmen are setting new standards in quality, fit, and finish. The 64 is built at the Lien Hwa yard in Kaohsiung. The hull is laminated by hand with bi-axial and unidirectional fiberglass reinforcements. The hull laminate is solid below the waterline and is supported by a network of fiberglass stringers and cored fiberglass bulkheads. Topsides are cored with Core-Cell foam as are the decks and superstructure. All exterior surfaces are finished with high-quality gelcoat and the fit and finish is excellent. Hull colors in gelcoat are offered as an option. While new designs often gain weight during production, the 64's 105,000-pound displacement was on target with Sharp's detailed weight study. Most of Offshore's owners are serious cruisers and the 64's standard equipment list reflects this. It includes major items such as stabilizers, bow thruster, dual windlasses, and a tender davit. Offshore's ASG (All Systems Go) service and maintenance package is also standard for North American customers. The program includes basic tools and a monthly inspection of the boat during the first year of ownership. While the standard 575-horsepower Caterpillars will likely do nicely, I would opt for the extra muscle of the 715 Cats, as they will breath a bit easier at cruising speed. Add electronics and a tender and you're ready to go. Serious cruisers might also opt for a watermaker and a second generator. 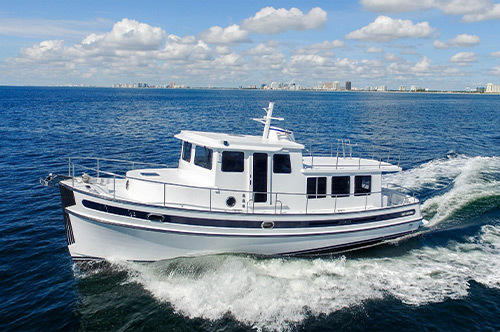 Offshore Yachts currently offers fifteen models ranging in size from 52 to 90 feet. 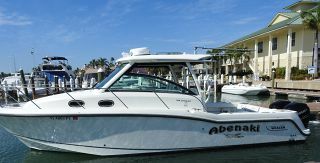 In my view, the 64 falls in something of a sweet spot, since she is about as large a boat as an experienced cruising couple would be comfortable handling without a crew. 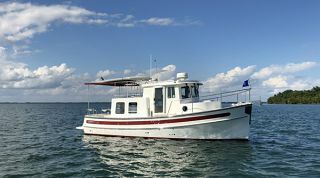 Whether your float plan includes Baja or the Bahamas, if your interest is cruising, the 64 is a boat to consider.